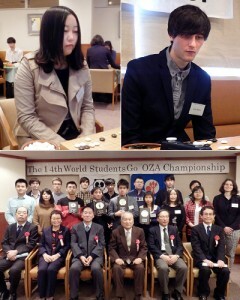 Attention students, the deadline for entering the World Students Go Oza Championship is coming up October 21. Students under the age of 30 and currently enrolled in an American university/college are eligible to participate in the online preliminary round, irrespective of nationality. Airfare and accommodations for the World Students Go Oza Championship — Feb 18 to 22, 2019 in Tokyo, Japan – will be covered by the event organizers. Click here for details and here for the entry form. 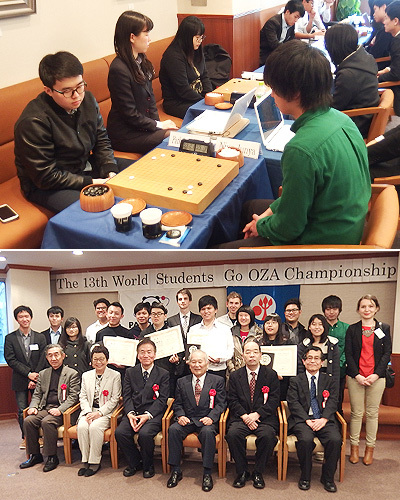 Registration for the 16th World Students Go Oza Championship is now open. 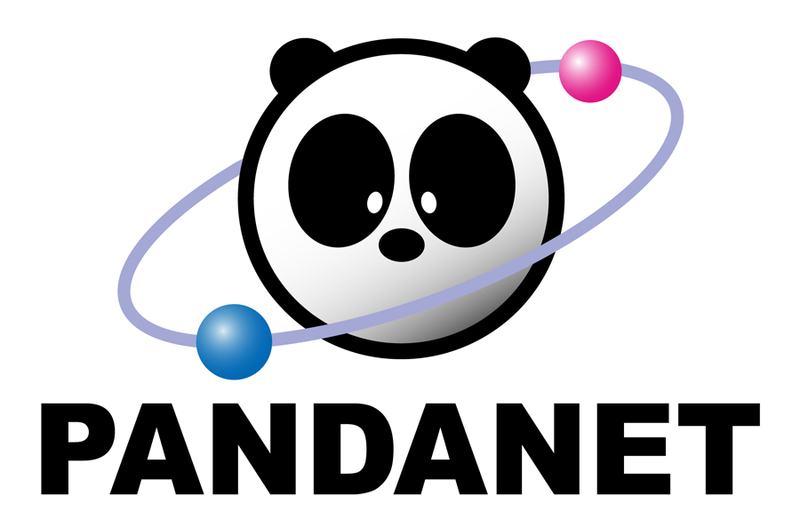 The preliminaries will be played on Pandanet to select 16 players from over the world to participate in the main tournament to be held February 19 to 23 in Tokyo. Click here for the entry form; registration is free. All university/college students under age 30 may sign up for the online preliminary tournament, except those living in China, Japan, Korea, and Chinese Taipei. Players are grouped by the location of their schools, irrespective of nationality. The application deadline is October 16, 2017. An online preliminary round will be held on Pandanet to select the 16 students who will participate in the 15th World Students Go Oza Championship February 20-24, 2017 in Tokyo, Japan to decide the world’s number one student player. Click here for details and here for the entry form. University or college students under the age of 30 can participate in the preliminary round, although students living in China, Korea, Japan and Chinese Taipei cannot participate in the online preliminary round. The application deadline is Oct 17. For further information, email sota@pandanet.co.jp or the All-Japan Students GO Association at world.sgo.oza@gmail.com. The AGA is seeking a student pair to represent the USA and Canada in the 3rd World Students Pair Go Championship. This event, which features exclusively college/university/graduate students, will be hosted in Japan at the same time as the International Amateur Pair Go Championship from December 2nd to December 7th of this year. To be eligible to compete, a pair of players must meet the following requirements: One male, one female player per pair; Must be current college/university/graduate students (no high school students); Under the age of 30; Must not be a student in a professional go organization (i.e. no insei); Must be an American / Canadian citizen. Note – the players will be responsible for paying 50% of the cost of round-trip airfare to and from Tokyo, Japan. The rest of the costs (lodging and meals) will be provided by the Japan Pair Go Association. There will be an online qualifier to determine the North American representatives on September 17th. Interested players should contact peter.nelson@usgo.org and cherry.shen@usgo.org, or president@usgo.org immediately. Wang Chen, one of the ‘Four Heavenly Kings’ who rule China’s amateur rating list, won the 12th World Students Go Oza Championship, held in late February in Toyko. Wang (right) defeated Ken (Kai Kun) Xie of New Zealand, Japan’s Yamikumo Tsubasa, Go Risa, also from Japan, and Chung Chen-En of Taiwan. Yamikumo, Go, and Chung did not lose to anyone else, so they finished as part of the four-way tie for runner-up. Tie-breaking points put Yamikumo second, Chung third, and Go fourth. Taiwan’s Hu Shih-Yun also lost only one game and came in fifth. 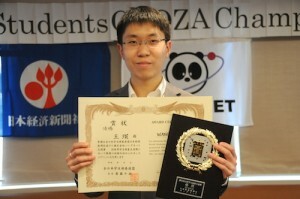 The opponent she lost to was the USA’s Maojie Xia, who had played the two Japanese and finished a highly commendable sixth. Viktor Ivanov (Russia, 9th place) and Kwan King-Man (Hong Kong, 10th place) matched Maojie Xia by winning two games apiece, and although Yanqi Zhang (France, 12th place) won only once, the opponent she beat was Zhou Shiying, the Chinese female player. At both the reception and the awards ceremony, officials in the All Japan Students Go Association, which handled all the organizational work (drinking party included), remarked on the rising level of play in countries outside the Far East. - based on a more extensive report on the IGF news feed, which includes complete results and clickable game records.